All treatments are designed to promote healing, alleviate pain and prevent reinjury. West Cork Chartered Physiotherapy Clinics are recognised and covered by VHI, LAYA HEALTHCARE AND IRISH LIFE HEALTH AND IRISH LIFE BACK-UP PLAN. Bandon Clinic – Innishannon, Ballinadee, Kinsale/Old Head, Newcestown, Timoleague, Kilbrittain, Courtmacsherry, Ballineen, Dunmanway. Clonakilty Clinic – Skibbereen, Rosscarberry, Ardfield, Timoleague, Dunmanway. Clearly, due to the close proximity of both Clinics, there will be a considerable crossover in the townlands serviced, which we hope will further facilitate ease with which the patient can attend either site. 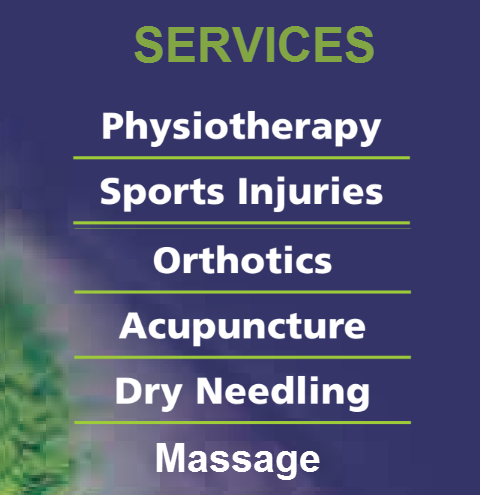 In addition to the services of physiotherapy and sports injury treatment the provision of orthotics, acupuncture and dry needling are three additional services that we use to facilitate an optimum outcome for the patients care and are both used if and when appropriate.